At Cathcart Street Primary School, punctuality is a high priority. We firmly believe it is essential that children attend school on time if they are to achieve their potential. Lateness not only adversely affects a child's attainment but also their personal and social skills and can make it difficult for them to settle for the day. 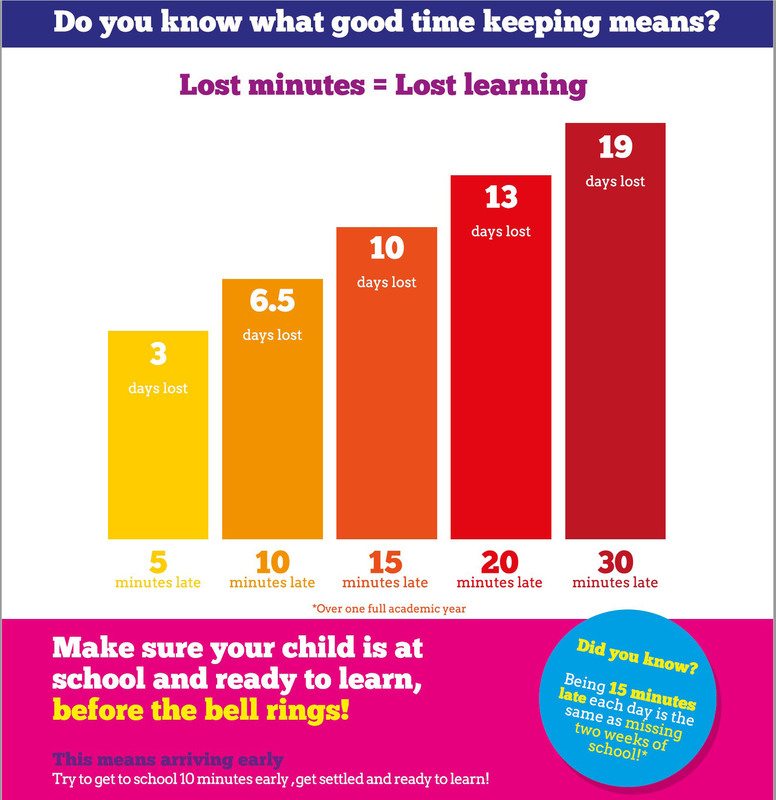 Lateness can have a significant effect on children’s progress as it equates to lost learning time. There is a clear link between attendance and attainment; the more time a pupil spends in school the more likely they are to improve their opportunity to fulfil their full potential. School starts at 8.55am. Children must be lined up in the playground ready to go into class by this time. Teaching Assistants remain on door duty on a rota basis to monitor late arrivals until 9.00am when the side doors are closed. After this time, parents are asked to take their children through the main entrance and must register their child’s arrival on our electronic signing in system. We also offer a free breakfast club for children in Foundation 2 to Year 6. Research has shown children starting the day with a healthy breakfast do better in school and it can help concentration and wellbeing. We offer healthy cereals and porridge, bagels, fruit and diluted fresh fruit juice. The club opens at 8.30am and all children must wait quietly in the entrance area until the start. All children must be accompanied by an adult until the club starts. Registers are taken at 8.55am and close at 9.30am. Children arriving after 9.00am but before 9.30am will be marked as late (L). Children arriving after 9.30am will be marked as present and given a 'late after registers closed' code (U). This code is classed as an unauthorised absence which will affect the child's overall attendance level. In addition to entering the ‘L’ and ‘U’ codes, office staff record the number of minutes late for each pupil, on each occasion. This facility allows school staff to monitor and manage developing patterns of lateness more effectively and make a clear link between lateness and missed learning time; and share such information with parents. Cathcart Street values all pupils and we are committed to working with families to identify the reasons for poor attendance and try to resolve any difficulties.